One of the benefits of the Panama Canal expansion project is that it has opened a new window to scientific understanding of the formation of the Isthmus of Panama and it’s importance as “The Bridge of Life”. There have been several fascinating articles about these discoveries. When the Panama Canal was built, enough rock was removed to bury Manhattan under 12 feet of rubble: 200 million cubic meters of earth. Now the slender waterway connecting the Pacific and the Caribbean is being widened to let through more and bigger ships, moving another 152 million cubic meters. This created the opportunity of a lifetime for geologists and paleontologists to understand Earth-changing events. More than 100 years ago, the scientific collaboration between Panama and the Smithsonian began when scientists conducted the Panama Biological Survey, basically an environmental impact statement for the construction of the Canal. From a storehouse full of fossil samples still to be processed and geological data to be analyzed, expect announcements of new findings about Panama’s unique geological and biological history for many years to come. According to Ari Daniel Shapiro . . . When the Panama Canal was first built a century ago, it unearthed scientific treasure – countless fossils and geological clues to Panama’s past. But once the construction stopped, the jungle rushed back in, blanketing the land and concealing the geology. [What] … makes Panama an interesting place for scientists to learn about the animals that were living here before the land bridge between the continents was formed – before crossing over into South America became possible. Recent digs have revealed a rich array of animals that lived here 20 million years ago, including miniature horses and tiny camels just a couple of feet tall. There was also a fearsome predator the size of a black bear, called a bear dog. Over the last several years, scientists have taken the number of species they used to think lived here and multiplied it by a factor of ten. Scientists are now filling in a detailed portrait of the animals and plants that were here at the moment when North and South America finally made contact. But Eldredge Bermingham of the Smithsonian Tropical Research Institute says this burst of discovery will not continue much longer. Paleontologists got a brief glimpse into Earth’s tropical past when the U.S. built the Panama Canal Zone almost 100 years ago. But the scientific world didn’t know what was there until the unearthed fossils housed at the Smithsonian were studied and Frank Whitmore and Robert Stewart published the first paper on Panamanian fossils at the end of the 1960s. At the time they determined that South America was a giant island continent with its own diverse and unusual animal life until the isthmus of Panama grew through uplifting of tectonic plates, connecting North and South America and cutting off the Atlantic Ocean from the Pacific. A few years ago the largest expansion of the Panama Canal began and the $5.2 billion project is giving scientists another glimpse of our tropical geological past. This time, a PhD candidate from the University of Florida unexpectedly found camel fossils while doing field excavations at the construction site in Panama. Aldo Rincon found the fossils of two species of small camel that roamed the area 23 million years ago, well before North and South America were joined together. 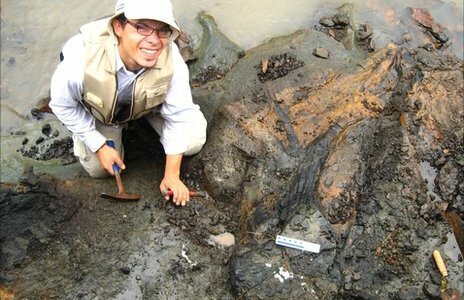 Researchers from Panama, the U.S. and the Smithsonian Tropical Research Institute also report finding fossils of horses and marine vertebrates, including ancient marlins and turtles. The 33-year-old researcher was most surprised by the camel’s teeth. He says they are crocodilian and is still trying to figure out why. Other paleontologists who have been following the fossil find for a couple of years believe that modern camels have flat teeth because they eat grass. Ancient camels may have needed sharp teeth to cut into fruit and thick foliage found in the area. So far five camel fossils have been recovered from the Panama Canal expansion project. Four belong to the larger species, which looked little like a modern camel. Besides having no hump, they probably only stood about three feet tall. The discovery by Florida Museum of Natural History researchers extends the distribution of mammals to their southernmost point in the ancient tropics of Central America. The tropics are home to the world’s most important ecosystems, including rain forests that regulate climate systems and serve as a vital source of food and medicine, yet little is known of their history because lush vegetation prevents paleontological excavations. Part of the reason that it’s such a surprise is that scientists thought they had pinpointed the date that North and South America joined together. But they may be wrong, given the discovery of these mammal fossils. Researchers have long thought the isthmus of Panama rose about 3.5 million years ago, but now that scientists have discovered a camel species living in the area so much earlier, that hypothesis is being questioned. Before Rincon and his team found the camel fossils in Panama, no one had spotted camels south of Mexico. The camel family likely originated in Florida and Texas about 30 million years ago and spread across most of North America and changed as they migrated south. A construction project near San Francisco unearthed some ancient camel bones a couple years ago that dated back 11 million years. The camels Josh Wyatt at PaleoResource found in the Caldecott Tunnel excavation were from giant camels that he says were probably the size of giraffes. Rincon made the Panamanian camel discovery over a two-year period but didn’t publish until recently. The study appears in the March 2012 issue of the Journal of Vertebrate Paleontology. Since 2007, when the multi-year excavation project began, thousands of fossils have been recovered and sent to labs across the Americas for analysis. Until the expansion project is finished and the new canal channels opened paleontologists will follow the footprint of the construction, searching for lost moments in geologic time, trying to piece together the planet’s past through the fossil record. This entry was posted in Uncategorized and tagged camels, camels in Panamal, formation of Isthmus of Panama, Isthmus of Panama, paleontology, Panama, Panama archeology, Panama bridge of life, Panama Cana, Panama Canal, Panama Canal Expansion, Panama Canal fossil discoveries, Panama fossils, Richard Detrich by Richard Detrich. Bookmark the permalink.